PHILADELPHIA, PA – April 11, 2017– Janney Montgomery Scott LLC (“Janney”), a leading full-service wealth management, financial services and investment banking firm headquartered in Philadelphia, PA, today announced that Richard J. Ballou, CIMA®, AIF, has joined Janney and will be leading the Atlanta Branch Office. 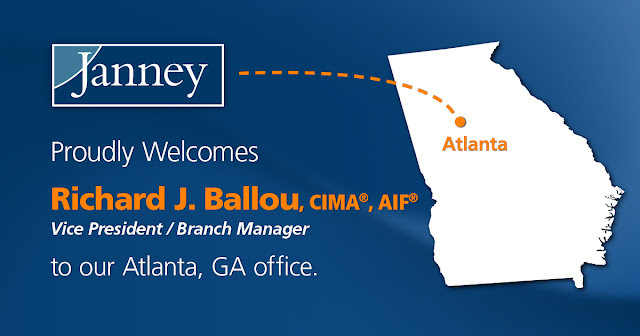 With over 30 years of industry experience, Ballou, vice president/ branch manager, will be tasked to lead the Firm’s expansion in the Atlanta region, as Janney continues to establish itself as the regional firm of choice for Financial Advisors, industry professionals and affluent clients. Ballou will report directly to Regional Manager Andrew Kistler. Ballou was most recently affiliated with Columbia Threadneedle Investments, where he served as South-Central Divisional Manager. In between two stints with Columbia Threadneedle, Ballou served as corporate vice president and complex manager of JC Bradford & Co, later UBS. He graduated from Boston University, and has earned both his CIMA® and AIF designations. Janney’s Atlanta, GA branch office is located at 3630 Peachtree Road NE, Suite 850, Atlanta, GA 30326.